World Environment Day (WED) is celebrated every year on 5th June 2015 to raise global awareness to take positive environmental action to protect nature and the planet Earth. It is an initiative by the United Nations Environment Programme (UNEP). 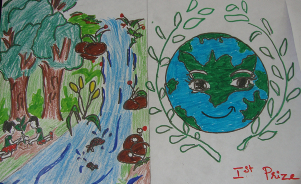 The theme for 2015 was 'Seven Billion Dreams; One Planet; Consume with Care'. This year, MJC celebrate WED to spread awareness about this theme among our students. Towards this we organised a number of activities for our students. The day began with two brief speeches by Ms. Esther Rani of 10th grade and Ms. Devika Sharma of 12th grade during the morning assembly. Both the speeches were really eloquent and succeeded in expressing their views on the safeguarding of the environment. 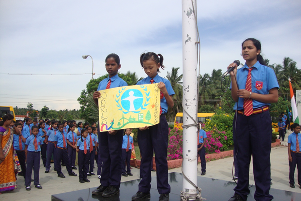 Later during the day, a drawing contest and a quiz were held for the students of the Michael Job. Higher. Secondary School. 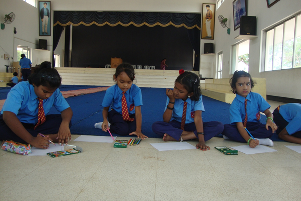 The drawing contest was conducted in the chapel for the students of Grade I - VI. 80 students, 20 from each house participated in this competition. 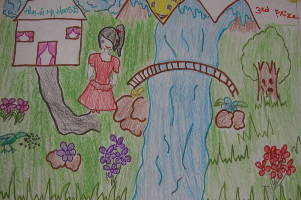 The first prize was bagged by Alisha Oraon (Blue House) from the 6th grade. She was followed by Gail (Green House) from 6th grade and Sibina Nayak (Yellow House) from the 5th grade. A Quiz was held in the school block for the students from grade 7th to 12th. The quiz had two rounds –the preliminary round (written format) and the finals (oral) with 16 students, 4 from each house, Team red won the first prize. The team members were K.Yazhini (Grade - X), Ching Thian - Gill (Grade - IX), Anjana Mahalik (Grade - X) and Celesti (Grade VIII). 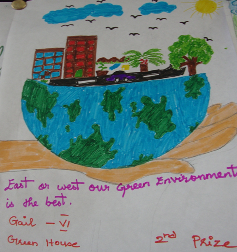 The second and third prizes were awarded to the green and yellow houses respectively. The whole programs were informative and enjoyable for the whole student community.